Enter the initial text that will be displayed for the user to edit. Select the default location for the initial text. Choose the font that will be used. This will pull from your Windows fonts. Checking this allows the user to drag the text to a custom position. If unchecked, the text will stay in the initial location. 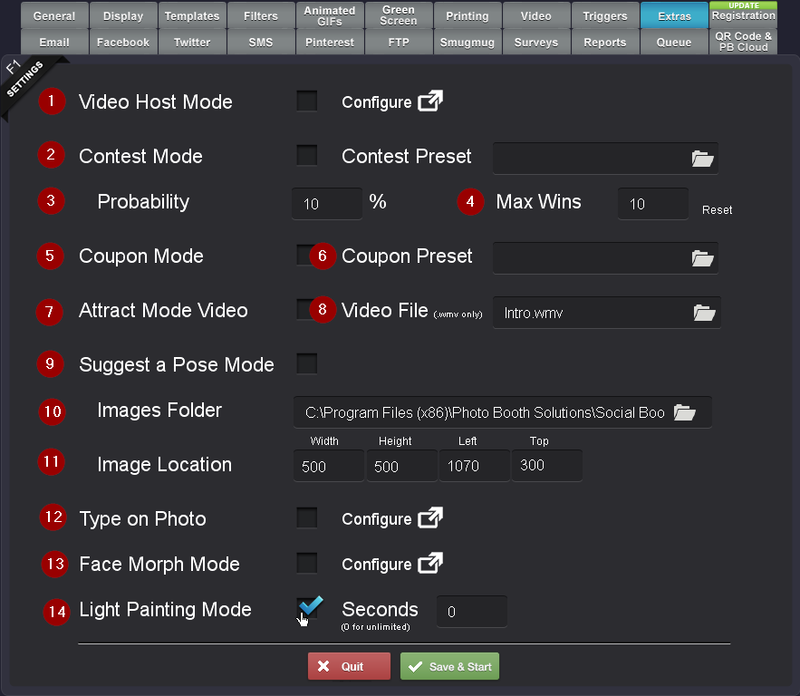 Have a video play during the photo sequence to walk the user through the process. Enter the number of cue points that you want included in the video. This will likely be the number of photos. Select the number of seconds into the video each cue point is located and if it is a photo. The camera will be activated for each photo cue point. Enabling this will play a video through the photo sequence to explain the process. 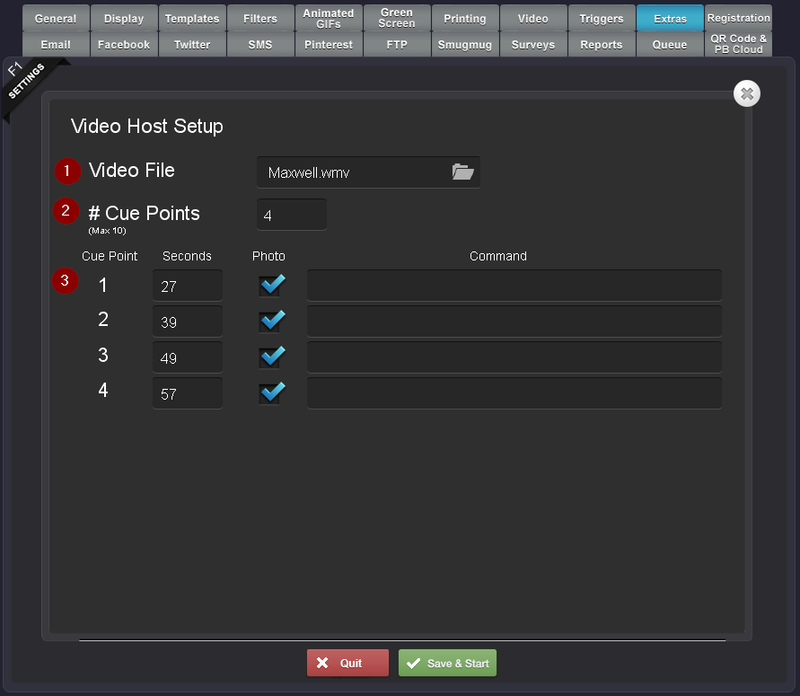 See the Video Host configuration screen after enabling. Enabling this will have Social Booth activate random winners during a photo sequence. The winners will have a different photo template background or overlay. Choose the preset settings file that should be used. You can change the background only or have an entirely different template layout! This will be the probability of a winner. Each photo has the same random chance to win. For a probability of 10%, each photo has a 1 in 10 chance to win. Once the number of winners hit the maximum contest mode will automatically shut down. This button will trigger a different preset setting for uploads vs printed templates. Choose the preset file you want to use with coupon mode. Have a video playing while there is no active photo sequence. Select the Video File you want to play. Select the folder containing the photos you want users to imitate. Set the location of where the imitation photo should appear on the screen. 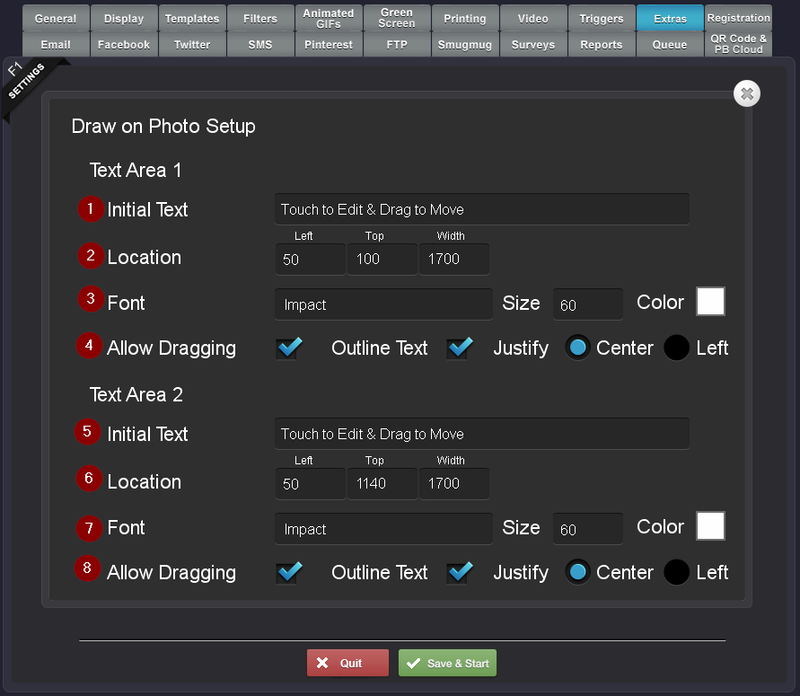 Allow users to type on the photo using preset captions, locations, and colors. See the “Type on Photo” section for configuration notes. Have the users take two photos and morph into one or have the user take one photo and morph into a preset image. Using a long exposure and dark room let your guests paint using light.